How Choose Trusted Online College or Best University? Choosing a right college or university for taking up an online degree program is a daunting task. There are numerous online degree programs offered by so many colleges and universities, so picking the accredited online colleges is some difficult task. Online education is expensive and considering the financial investment, finding a right fit is a challenge. And ultimately, your choice of courses will lead to a career path. Prior to enrolling for a degree program, you have to make sure that your choice of the program reflects your interest and passion. If you are to take up an online course to enhance your career path, it becomes somewhat easier to make a choice as you are clear that what degree program you want to opt for or at least you have some idea of the skill and knowledge in a specific area. 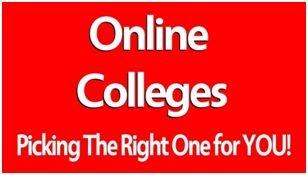 Check here given some best tips for select best online colleges. Online degree programs are offered by colleges and universities established for quite a long time and are quite reputed. When you take a degree from a reputed school, your degrees are considered with proven value by the employer. You have to go through the school history and evaluate it. Certain factors that can help you with evaluation are its partnerships within the educational community, employers and research projects, alumni etc. You can also study about student satisfaction and review. Accreditation is a measure of how the institute meets standards of quality education. The college or university you choose must have been accredited by appropriate agencies. It must be regionally accredited. Accreditation of the institute is considered by the employers. You have to find out that the online degree program accepts the existing college credits. The best approach is you enroll for the program that offers a direct route to graduation. Online education is costly and you have to figure how much tuition fee and other cost you will have to make towards the online degree program. You ensure that if there is any extra cost, it is made transparent and needed to fulfill the requirement. You also have to explore the financial obligations if you take any time off. It is recommended that you take some general course online prior to enrolling for any online degree program. Online education is expensive and you will have to pay for each credit. Ensure that the courses and degree makes sense and help you reach your career goal. You must review the degree plan and its curriculum prior to enrolling for it. You can study placement rates and go through student reviews. You have to see how the learning modules and support needed for taking the courses is provided. You review the course work, learning content, and faculty, see how learning modules are provided, how you can take lab work, assignment work, hands-on projects, interaction among the peer group, expert advice and guidelines etc. You also have to see how well academic support will be provided to you; being an online program, you might go through some technological glitches. Online degree programs offer you an opportunity to develop skill and gain knowledge needed to put you on the career path. Know your options, inquire about the related matter and take right decision about which school you have to choose. There are numerous online degree programs offered by so many colleges and universities, so picking the accredited online colleges is some difficult task. You can study placement rates and go through student reviews.